During this time of year it seems like we always have guests over to our home for some fun parties, cookouts and activities. Often times I whip up some yummy appetizers and serve them right along some delicious drinks. Nothing speaks more to me then pineapple during the summertime so I was pretty excited about this delicious pineapple rum punch recipe that was recently sent to me to share with all of my foodie blog readers. The versatility and delicious sweetness of Moscato make it the perfect base for a cocktail. 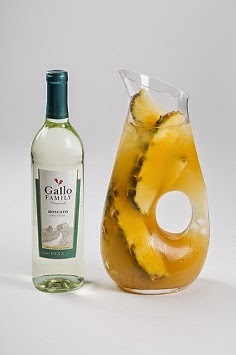 Gallo Family Vineyards has created a series of delicious wine cocktail recipes using Moscato, including the refreshing punch below. Punches are the perfect way to entertain in a group as they can be prepared beforehand and leave the host free to enjoy spending time with guests! Also, a great tip for decorating is to cut a slit in the corks pulled from the wine bottles and slide in a card to label the food choices in an easy and elegant way. Then, once the party is over, be sure to use your Gallo Family Vineyards corks to donate to Meals On Wheels Association of America through the Every Cork Counts program. Preparation: In a small pitcher combine pineapple juice, coconut water, spiced rum, moscato, lime juice and simple syrup. Pour over ice-filled glasses and garnish with pineapple wedges.